Everybody loves Jane Austen. Pride and Prejudice, Sense and Sensibility, Emma, Northanger Abbey—the list goes on. Stories that you can just sink right into. Characters who come alive. Everybody has favorites, but I'll bet nobody's favorite is Lady Susan. 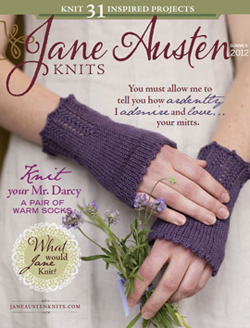 I had never even heard of it until we were preparing to publish the first issue of Jane Austen Knits, at which time I reread the whole Austen oeuvre. Lady Susan is the first, or one of the first books that Austen wrote, and it is just strange. No wonder she never submitted it for publication. (It wasn't published until 1871, long after her time.) The main character is beautiful, witty, clever, conniving, vain, mean-spirited, and immoral. Having been recently widowed, her goals are to marry off her daughter (whom she despises) and then marry off herself to the best match she can finagle. The book is written in epistolary style, a collection of letters from various characters to each other. Given the venom and guile that drip from some of the correspondence, I was surprised to see a dainty, lovely little shawl dedicated to Lady Susan's daughter, Frederica, in the brand-new issue of Jane Austen Knits. Well, Frederica deserves it. For all the spite her mother heaped on her, she had a delicate and virtuous sensibility. It's only right that, more than 200 years later, Frederica should get a little love. 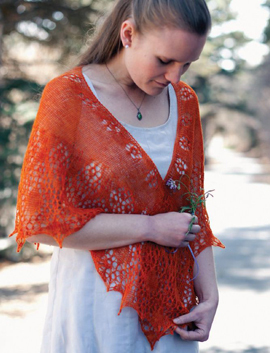 The shawl, or shawlette, is a lacy golden-orange triangle of Merino/silk accented with tiny seed beads. It is lovely. Among the things I find most charming about Jane Austen Knits are the literary references and the historical background. It's so much more than a collection of lovely knitting patterns. It's an invitation to dive into the early nineteenth century, and sometimes that is just the very place I long for.